I came across a competition on The Adventures of a Potty Mouthed Mum yesterday and it was a Harry Potter comp. 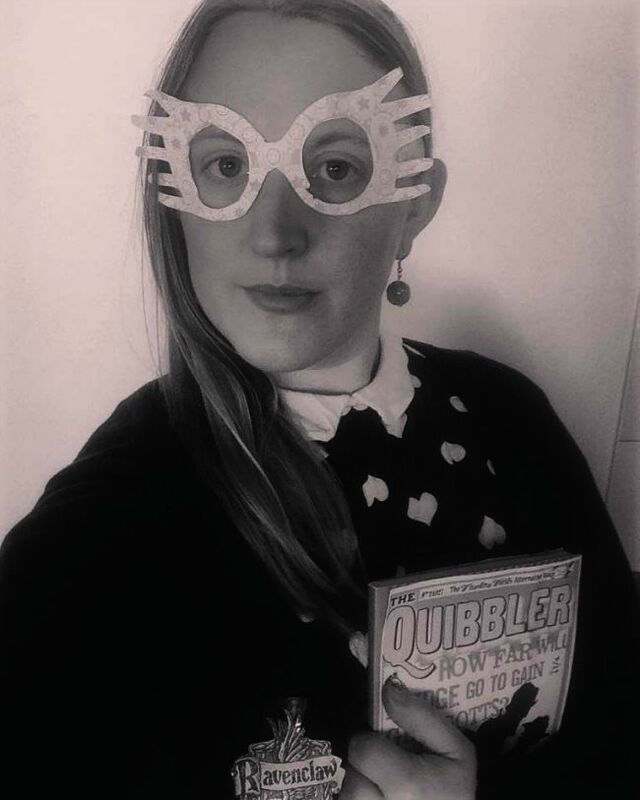 I got all ready to do my usual rafflecopter business when I scrolled down to find that on this occasion I was going to have be very creative if I wanted to win the prize of a fabulous Harry Potter book set! If you know me you'll know my love for Harry Potter. I've got the films,I've of course got the books, I've visited the studio tours and loved it and am going to see it again this year (in the snow!!) I have PJ bottoms, tops, socks and tracksuit bottoms to badges, pencils, notebooks and even a damn mug I LOVE IT. So here is my entry into the above mentioned competition. I've gone with some leggings and a skirt I think Luna would be okay with, a black cardigan with Ravenclaw (kind of) stuck on it, some round earrings which are almost like her rather individual Dirigible Plum Earrings in the film and I've added my pink converse, Quibbler and Spectrespects for that finishing touch! All of this put together with random clothes and a printer! *Update! * I won this competition! As a massive Harry Potter fan I'm obviously over the moon. Thanks to Adventures of a Potty Mouthed Mum for hosting this fab comp and I really, really can't wait to receive my Harry Potter Book Collection from The Book People! So I decided to make life difficult for myself this week for The Great Bloggers Bake Off by baking a Spanische Windtorte for dessert week. I wasn't going to go near a dairy free creme brûlée no matter how much I wanted to and I didn't want to do the cheesecakes because finding a recipe was driving me nuts. Some how searching the recipes I could only really find the words 'raw', 'healthy', 'sin free', 'guilt free' am I the only person who doesn't give a fig about the guilt!? I felt like it! Besides, I baked a vegan and gluten free cheesecake in a previous Bake Off challenge so I was only left with the 1 option really! 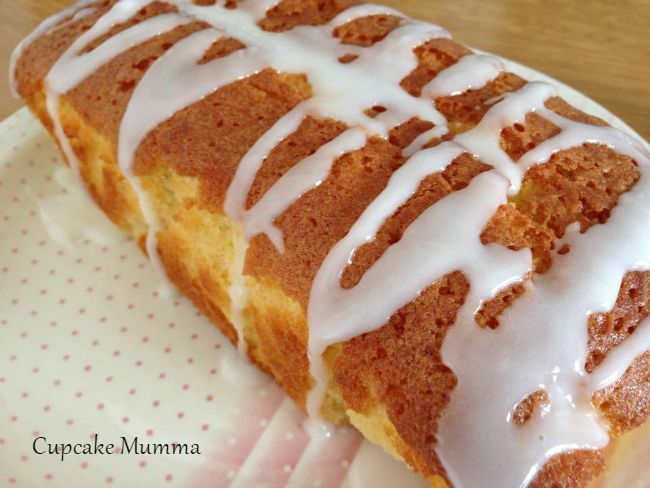 I'm not going to lie, this bake was time consuming, tedious and at times I wasn't sure about sharing it AT ALL. I've replaced the traditional violets with some marzipan roses instead (my budget didn't stretch to the fondant icing and colours needed for this week) I also had to find an alternative to the cream centre. I did that by using several cans of coconut milk chilled in the fridge overnight. Now for the actual meringue. You're supposed to make several types of meringue at different stages; French Meringue for the 'cake' and lid and Swiss Meringue for the decorating. I only used the French meringue because I had so much! 1. Line 3 large baking trays with baking parchment. Draw around a 8inch baking tin on 2 of the trays and then another one on the remaining tray. (You should end up with 5 circles). Preheat the oven to 120C. 2. For the meringue shell, tip the egg whites and cream of tartar into a large clean bowl and whisk with an electric mixer on high speed until the whites form stiff peaks. Add the caster sugar, a tablespoon at a time, whisking continuously to make a thick, glossy meringue. 3. Spoon some of the meringue into a piping bag fitted with a plain nozzle. Pipe a thick ring inside one of the circles on the baking tray and continue spiraling until the entire circle is filled. Do the same with a second circle. This creates the base and the top of the meringue cake. Do this with the 3 remaining circles, except don't fill in the circles, so that you have three hoops of meringue - these create the sides of the meringue shell. Bake for 45 minutes. Remove from the oven and leave to cool. 4. Meanwhile, make the flowers for your finished bake. I used marzipan and a silicone rose press. To be traditional you'll want to make fondant violets. I made mine and popped them to one side until needed later. I made 11 in total. 5. When the meringues are dry, gently slide 1 of the cooked, filled meringues onto a heatproof plate. Spoon some meringue into the piping bag and pipe dots of meringue around the edge of the circle. Put 1 of the meringue hoops on top and repeat with the other 2 hoops. Be gentle! 6. Pipe meringue around the sides to hide the hoops and use a spatula to smooth out the meringue so that the sides are smooth and straight and look like a cake. Bake on the plate for 25 minutes (45 if you're going to be doing the swiss meringue for decoration). Remove from the oven and leave to cool then decorate a little with the french meringue. You won't be able to do anything fancy with this meringue. I baked the lid with its decoration at the same time as putting my cake back into the oven to bake the piping. 7. For the filling, open your tins without shaking them. 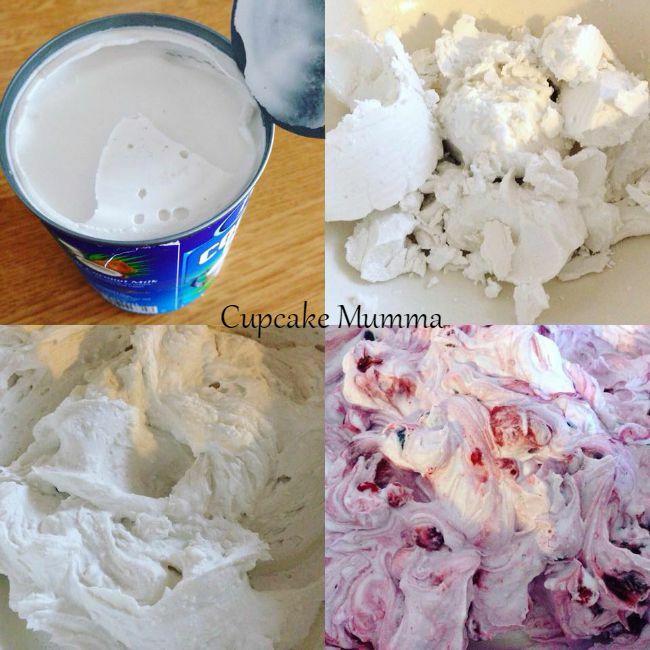 Scoop out the solid cream then whip the cream together with icing sugar if you want it. 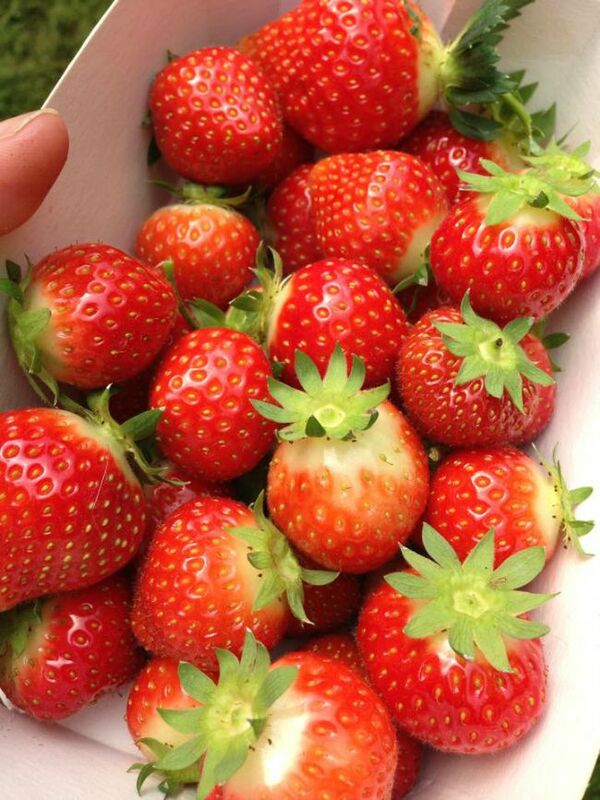 Fold in the strawberries and raspberries. (I used frozen berries, please don't do this because the moisture from the berries made my wonderful cream not as wonderful!) I popped it in the freezer to thicken again before I spooned it into the cooled meringue cake shell. Once done you can put your lid on and decorate with your flowers. Serve straight away! Here is my finished bake. It took a good couple of hours but it got made! I spent from Thursday evening at my parents house so had a late night making the windtorte on Sunday! 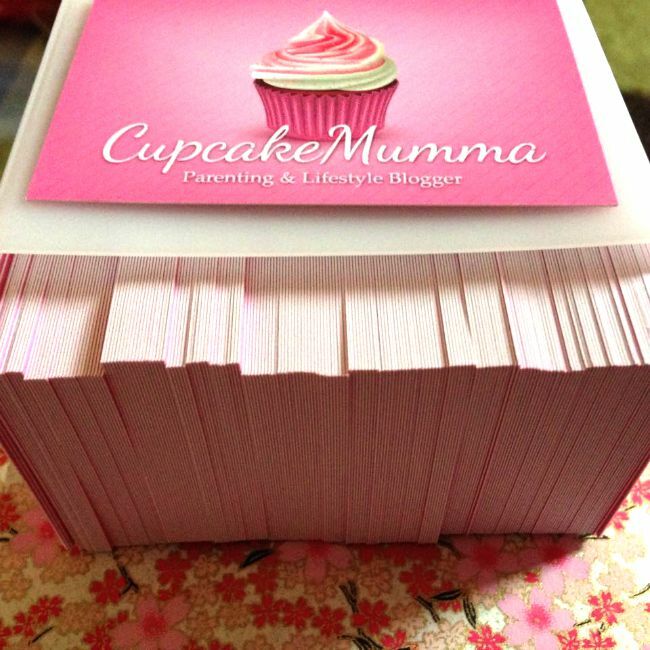 But it's done and all linked up with Utterly Scrummy who is hosting Mummy Mishaps link up this week. Windtorte with filling and lid. 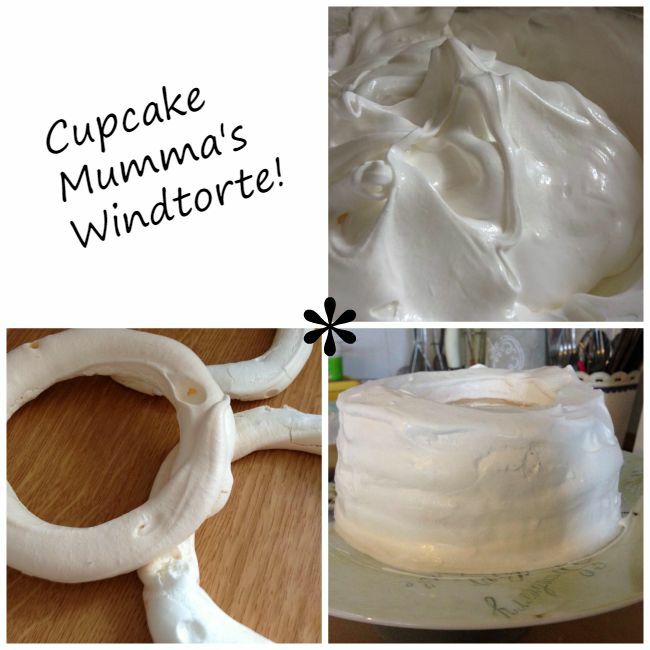 Do you fancy giving this windtorte a go? Or perhaps trying the delicious vegan whipped cream? Let me know how you get on! 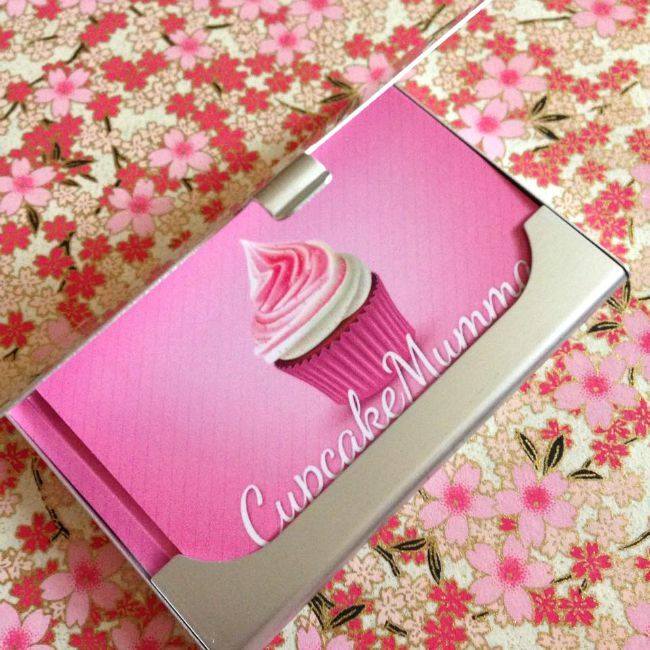 The Cupcakes go to Cambridge! We're back home from a week away in Cambridge visiting my Aunt and Uncle who live there. We were put up in 2 caravans, one for sleeping in and one for chilling out in. 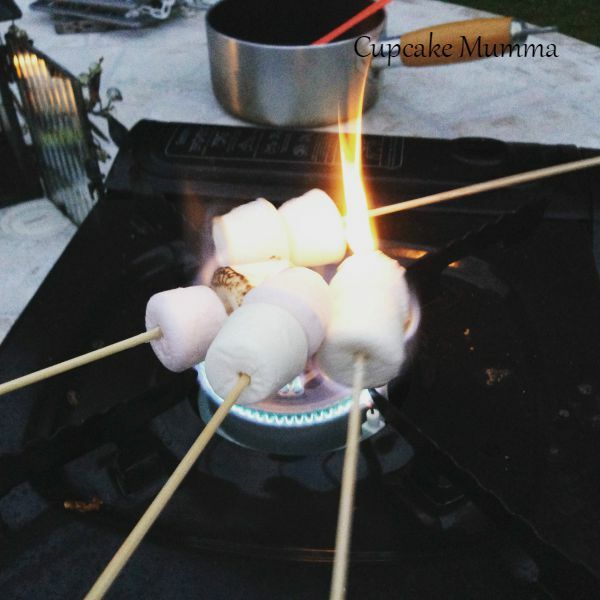 I was quite excited to be camping in the caravans, we even found our old camping stove which we wasted no time putting to good use by toasting marshmallows. 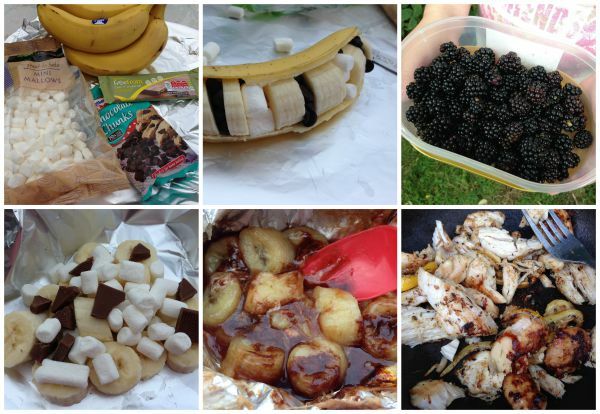 We also had fried breakfasts, chicken and rice with asparagus and marshmallow and chocolate wraps. We had loads of fun swimming in the pool and trying out the hot tub. We spent our anniversary swapping favourite sweets then looking after Midge who spent half the day being sick. Luckily it was the wettest day of our whole holiday so I got to read my book all day while Midge played games and wrote postcards. Mr B and Little A went to see the dinosaurs at the museum in Cambridge. We went into Cambridge twice during our stay, seeing the river and boats, the beautiful buildings and local markets. I was sad to miss meeting up with my pen pal and best friend due to illness, I know she was gutted too. We looked in comic book stores, Primark had some bargain sales on and Mr B got to look in his sports shop. I have left wanting to buy a bicycle! 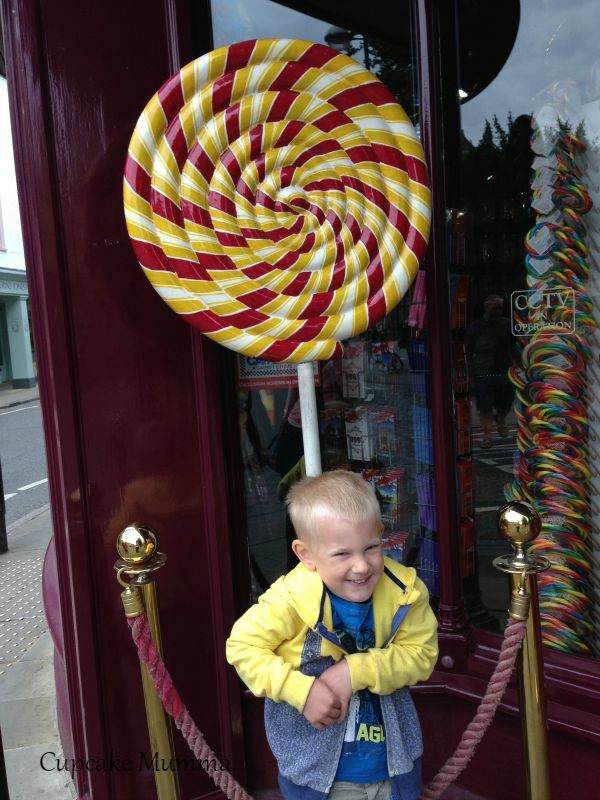 We found an awesome sweet shop! My Aunt and Uncle made us a lovely roast chicken dinner with champagne to celebrate our 3 years together. 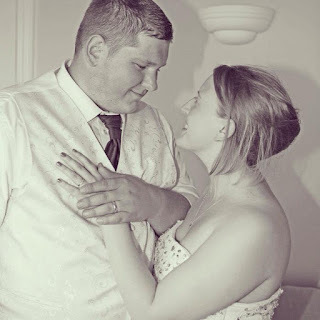 My Uncle even put together a video of our wedding day which was just lovely to look back on. Little A loved watching himself as a baby and Midge looked ridiculously cute! Our heart candle holders from them are beautiful and will go outside somewhere in the garden. 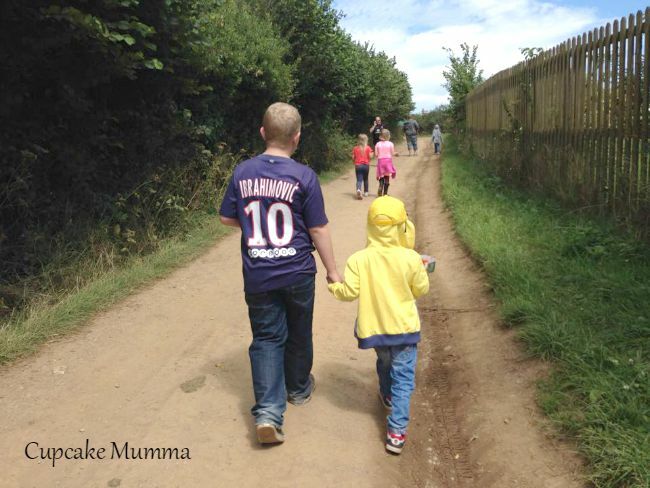 We had some lovely walks, picked blackberries, spied insects, went down paths to see where we came out. We went to a local messy church with my cousin and had lunch out to catch up which was great. Later my younger cousins came back to swim with us. We had a pub dinner on our last night which was delicious and very much a treat. We even saw more family in the morning before setting off on our long journey home to Cornwall. Our highlight there seeing a Paddington Bear statue and getting a photo with him, ye! Blackberry picking, power ranging siblings! 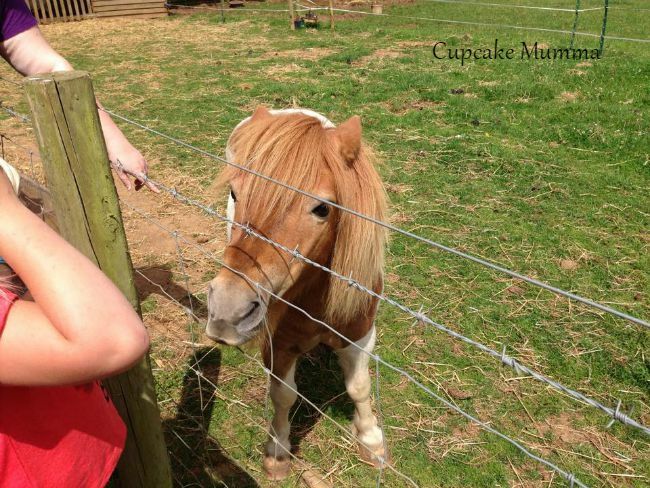 As this is my blog I've written from my point of view so I wanted to ask Mr B and the Mini Cupcakes what they thought of their holiday too. Midge: I loved seeing my cousins! At first I didn't like the hot tub but then it wasn't so hot the next day and I loved it. My cousin made water go in the air which was really funny. Little A gave me his rubber ring which was good fun because I can't swim. 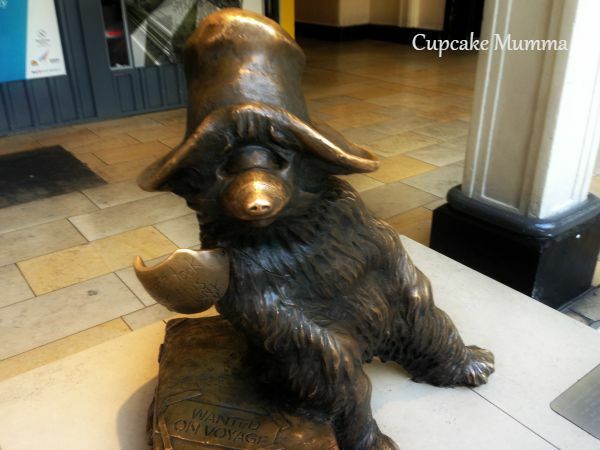 I loved seeing Paddington Bear at the station because I love him. Toasting marshmallows was good fun but we hated the wasps, there was SO many. 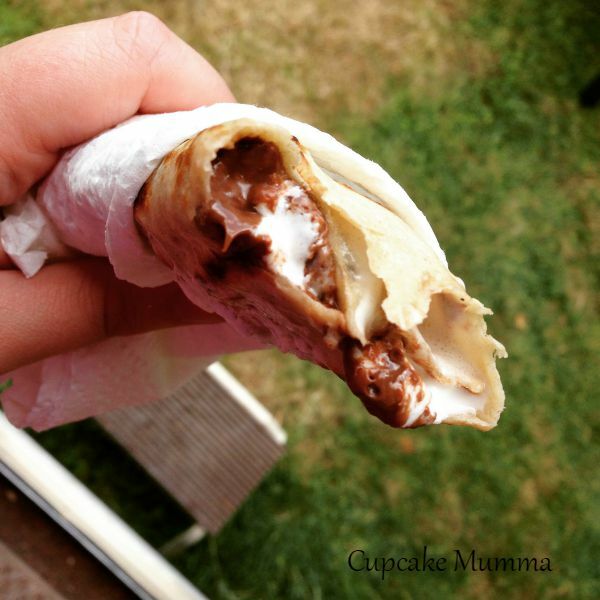 I didn't like the wraps either...just the chocolate! I got to sleep on the top bunk one night too which was fun. I love Cambridge holidays! 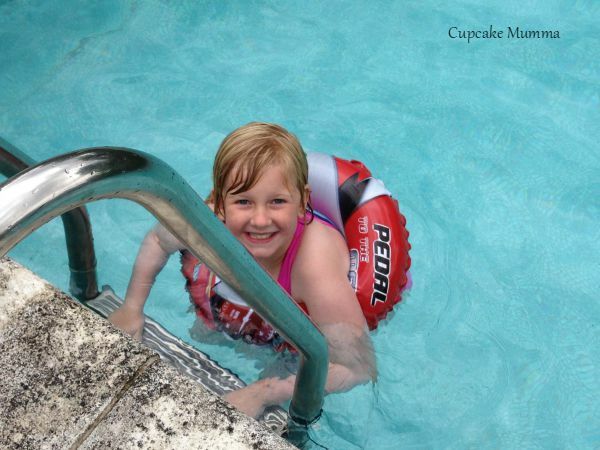 Little A: (The) Swimming pool was my favourite and the hot pool! Paddington Bear, big train and I love my cousins. Dropping my red dinosaur made me sad, he dropped on the track. I don't like big choo choo train anymore! Mr B: The best part for me was just getting away from it all. Having a break from work and town life. Everyone enjoyed going into Cambridge, I liked staying at the caravans to cook the food and relax. Taking the kids in the pool was great because it's not something we do often back home at the leisure centre. I had good fun it too! We had a lovely time and I hope we can return next year. We've got a break planned with a lovely company in October but more on that another time, we're excited to back shall we say! Hope you are enjoying the last of the summer break too! This week is bread week on Great British Bake Off and I know for a fact that a few of those joining in were dreading bread week slightly whether they were a free from baker or not! 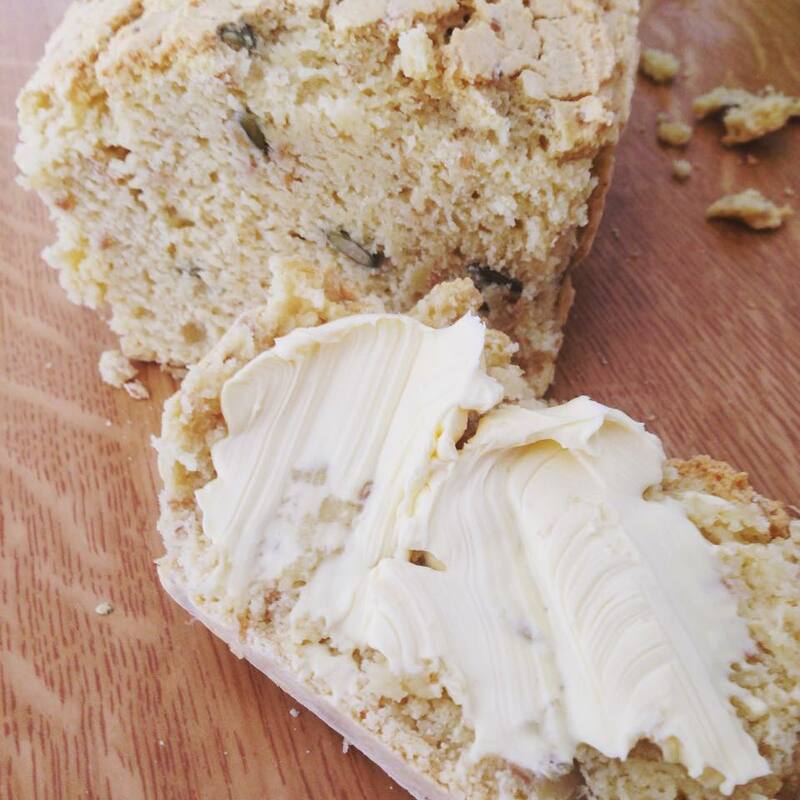 I already knew which quick bread I was going to do and although it wasn't as great as the first time I baked it, the loaf was still incredibly moorish and even the children helped to devour it. I found my bookmarked Chickpea Bread recipe from The Intolerant Gourmet and followed the instructions to the letter (always a good idea with a bread!) I love this recipe because it doesn't need a thousand different flours to make it which I can't afford. All you need is self raising flour (I use the Doves Farm brand) and Gram flour which can be bought from any good health food store. I also needed cider vinegar, I think if you can't have yeast you'll need to use sunflower oil? I'm sure you can find out more on Pippas post. The loaf came out quite hard on the top which wasn't easy to cut through but had a delicious flavour. The center was delicious and perfectly soft, just like it should be. Always leave gluten free breads to cool because they can often look stodgy and undercooked when all they need is to be cooled properly. We ate the bread warm with lots of butter and enjoyed every last slice. Fancy trying chickpea bread? I think you should! Today is myself and Mr B's third wedding anniversary. We're celebrating this year whilst on holiday with Midge and Little A which is a lovely way to spend it. We have both bought each other the simple gifts of our favourite sweets, some Reece's sticks and American chocolate for Mr B and some marshmallows and Strawbs for me! I think when we return we'll go for a nice dinner together because we are well overdue some Us time! Three years probably doesn't sound like much to most but I love every added year with my Husband and treasure each and every year. I hope we never get lost, I hope we always remember that we've come through so very much together and I pray I will always believe in us and our marriage. Mr B you are my soul mate and I so want to spend many, many more years with you my wonderful husband! Today I plan to just relax with my family and appreciate the moment, the joy and love. 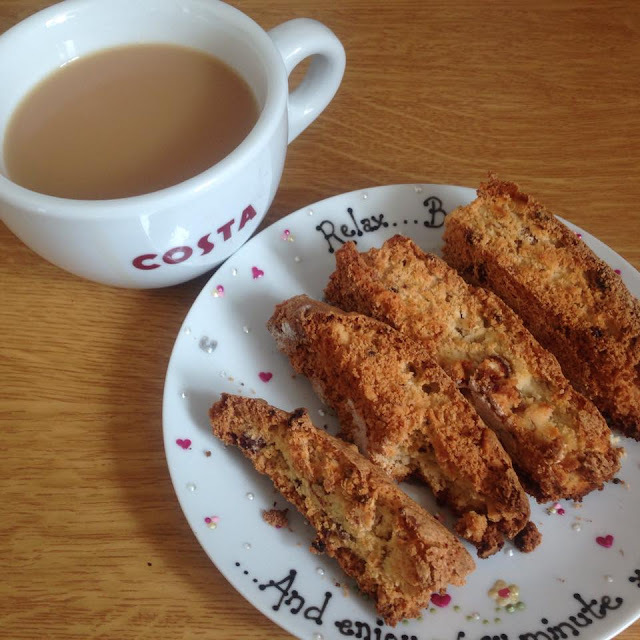 Today I'm blogging the biscuit challenge from last weeks Bake Off. I wasn't too worried about biscuit week, I mean I don't make wonderful biscuits but they've always tasted nice and been fairly successful. This week I took the recipe from another website. I found that 2 eggs would've been better than 3 and that there was too much water for me because my dough was pretty wet and it should've been a lot drier than that. Because my dough spread quite a bit I thought my biscotti was too long, I preferred the shorter pieces I had cut. It was also softer (so no star baker prizes would've been handed to me!) personally I liked the softer inside, my teeth don't like anything too hard so I was happy with my bake in this respect. 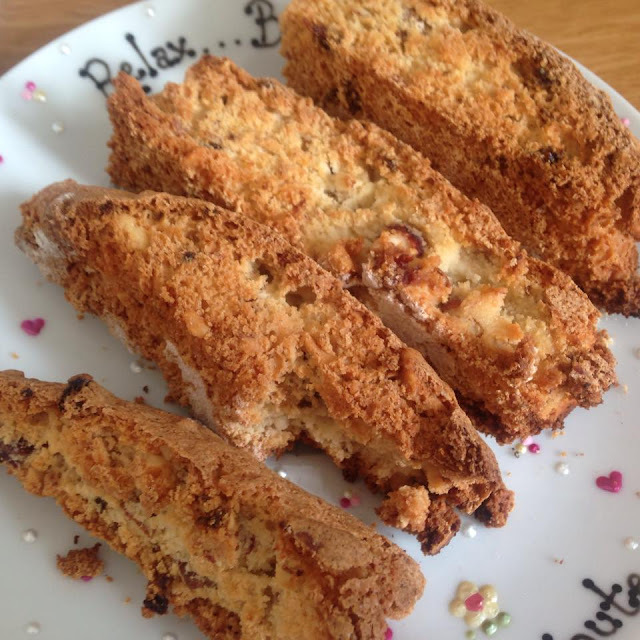 So next time I plan to use less egg and less water and hope to have more success, although I am very happy with my gluten and dairy free biscotti this week. The Bake Off is back and that means so is The Great Bloggers Bake Off! 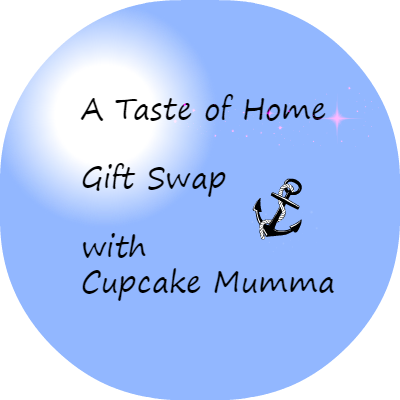 Im a little apprehensive about adding my bakes this year because I've seen so many fellow bloggers bakes already this week and the standard is very high! Of course this is all good fun and it's lovely to be inspired to bake again. 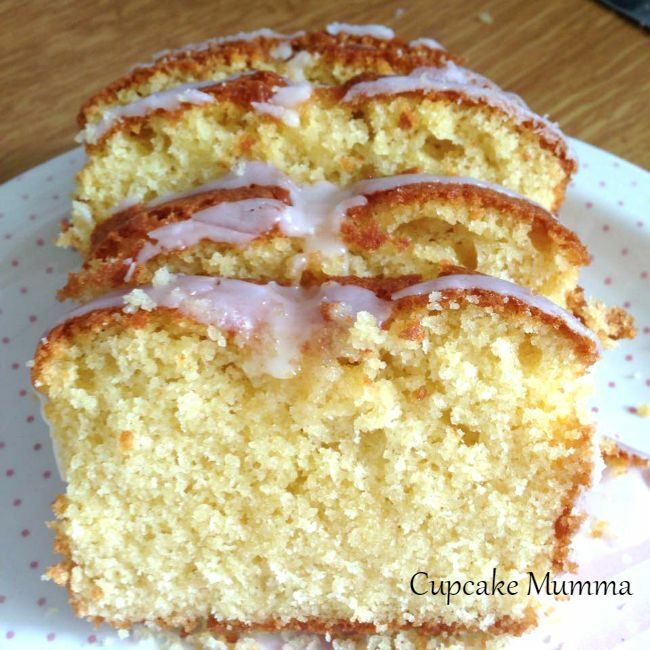 I have missed the link up because I've been busy and under the weather but I thought I'd share my cake week bake anyway. I'll probably miss a few link ups because i'm going on holiday too! Last week we had the best (and in my opinion the easiest ) week: cake week. I decided to go with a gluten and dairy free Madeira cake which is the first cake I ever learnt to bake as a little girl in my mums orange kitchen. I mixed the butter and sugar together then added the eggs plus a little flour to stop the buttery lumps forming. I then added the flour mixing well. Lastly, Midge added the vanilla plus a little gluten free baking powder. The overall look of the cake is very nice but if I lined the cake tin properly it would not have been so misshapen. Taste wise this cake was eaten in about 25 minutes so I'm taking that as a seal of approval! 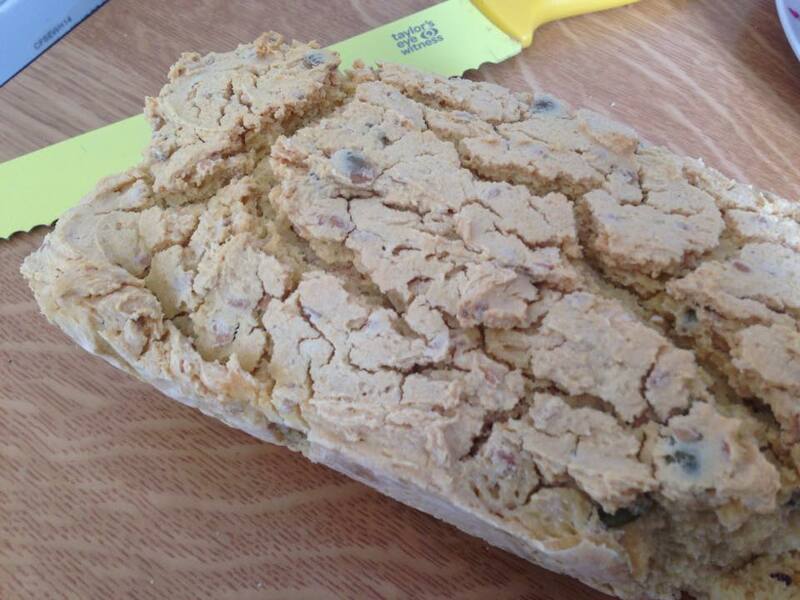 I was really happy with the inside, it was slightly fluffy but still firm which I like. It probably could've used 5 more minutes in the oven but I'm happy with my first bake. This week is biscuit week which should be interesting depending on what I go with! Next week is bread week which I feel slightly less optimistic about! 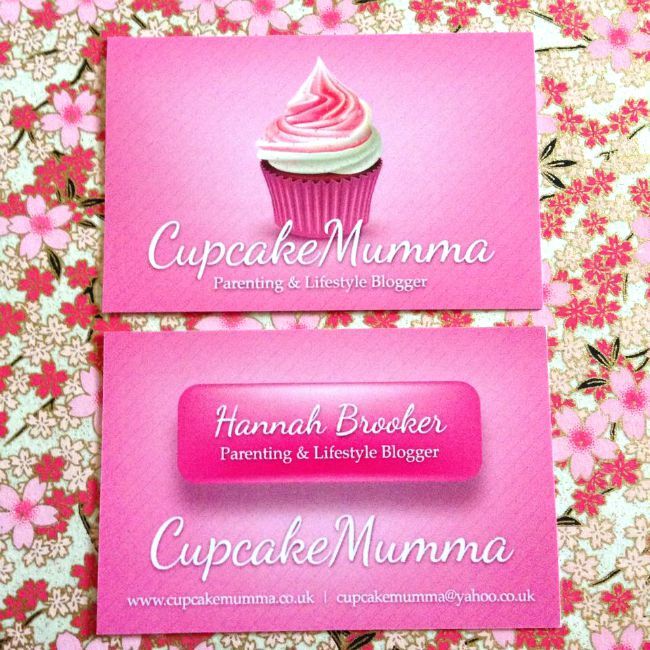 Are you joining in the Great Bloggers Bake Off 2015? Or are you baking along as and when you feel like it like i'll have to do until i'm back from holiday? 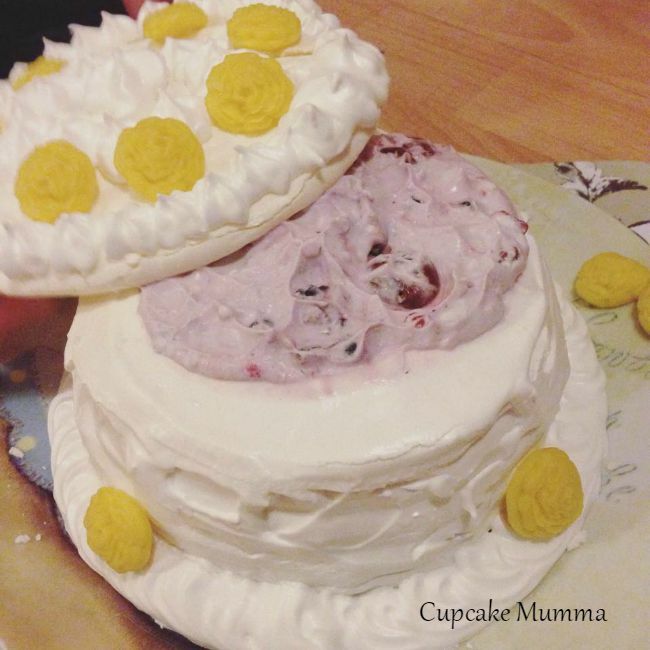 Perhaps you've been inspired by the show, if so I'd love to see your bakes! Hello all! We're on week 3 of our summer holiday here and so far it's going well (and fast!) Last week we made some trips to the beach and Lands End which I'll write about soon. We also visited Trevaskis Farm which is a farm very local to me that I love. 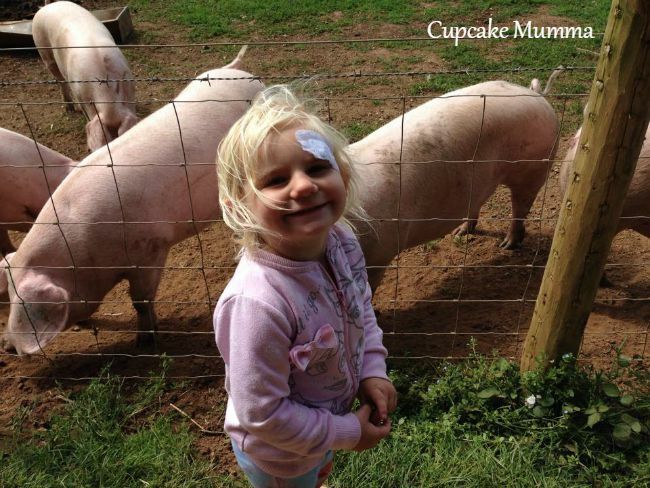 They are all so friendly up there and you can stroll around seeing and stroking the animals, picking fruit and shopping in their farm shop. 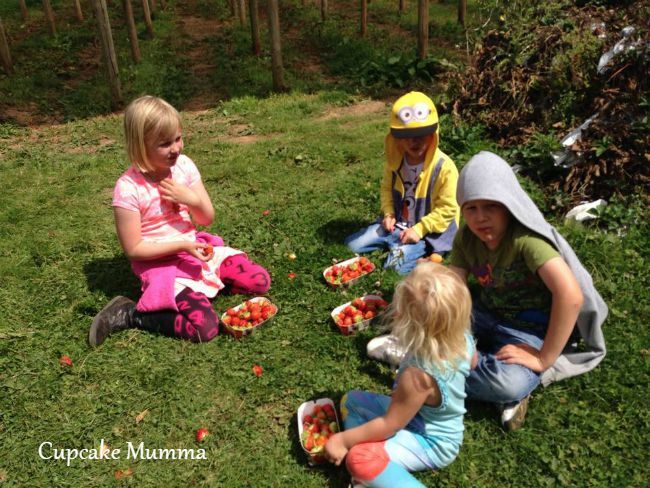 They love to educate children about the farm and about where our food comes from which is great. 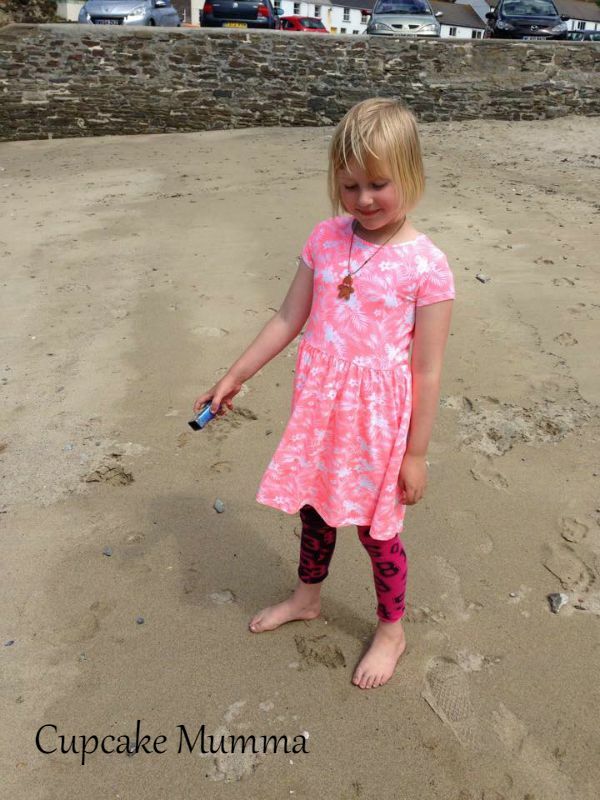 After the farm we did stop at Portreath beach for a drink outside and the children played happily on the sand for over an hour. 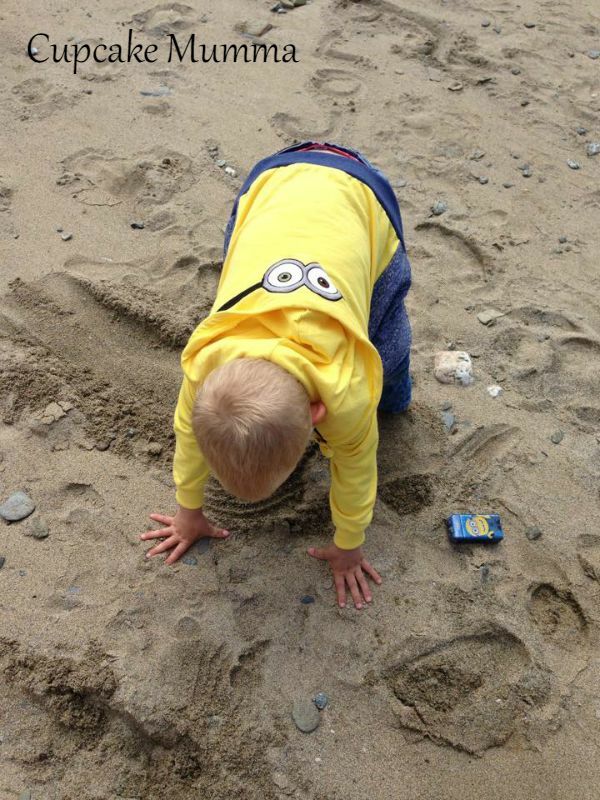 They buried their feet, drew in the sand and made sand castles as best they could with no buckets and spades. 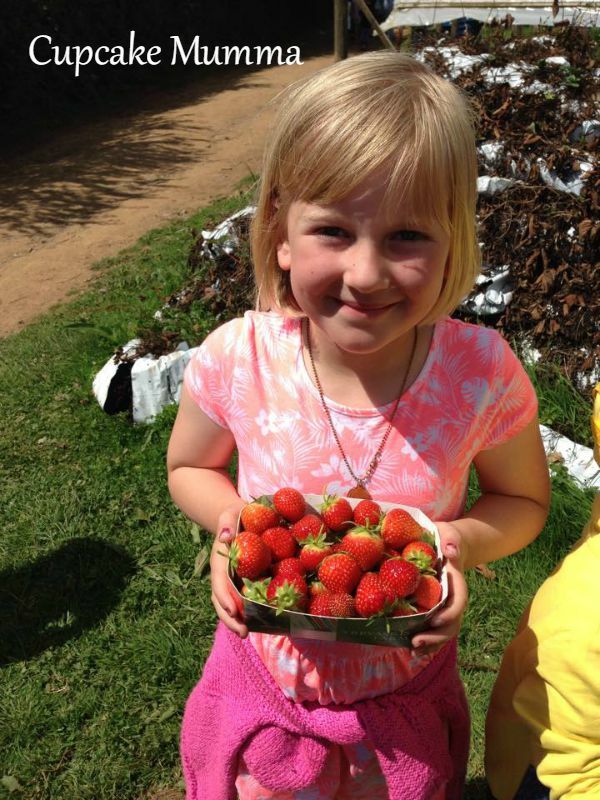 If you're in Cornwall do visit Trevaskis Farm as its a really lovely place for all the family to enjoy and you can get plenty of fruit for such great value that's super fresh and delicious. Nursery Graduation and Teacher Gifts! As you may be aware if you read my Last Day post, my Little Ones (or not so!) finally had their last day of school a couple of weeks ago. 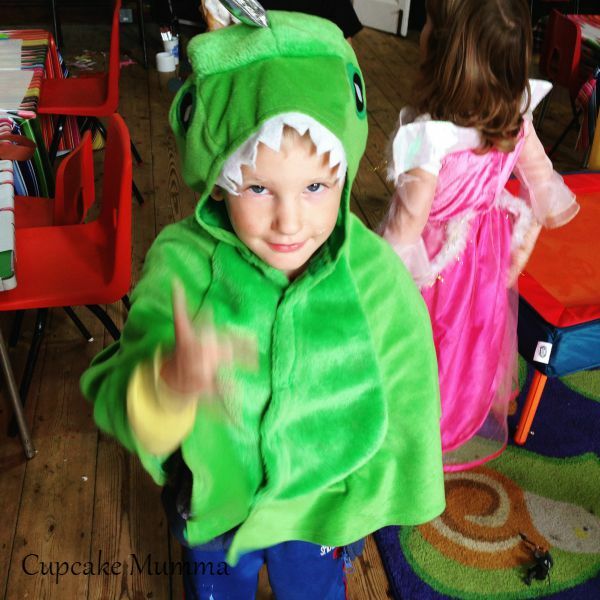 I've only just got around to writing about Little A's nursery graduation and the teacher gifts we gave away in the last week. 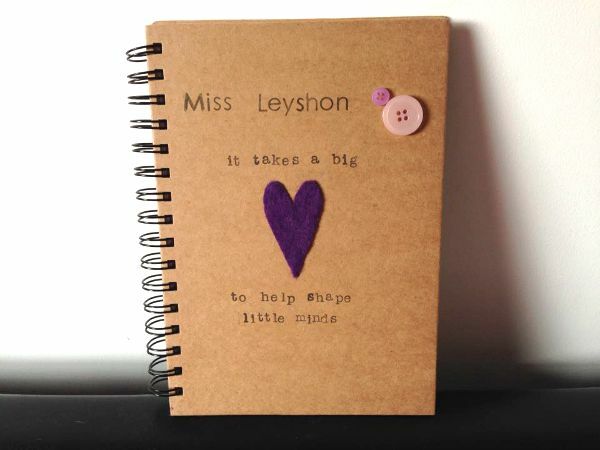 I don't remember giving teacher gifts to Midges Year 1 teacher's but I do remember her reception teachers having gifts because I remember thinking how much they had helped her and I wanted to say thank you. I made them little buckets full of stationery and chocolates which they all loved. Midge has now left year 2 and she is old enough to say whether she wants to go and share a gift with her teachers or not (some would find it embarrassing after all) of course, as I assumed, she wanted to give her teachers something to remember her by! I had several very lovely little plushies made for me in gift swaps from a long time ago that I hadn't looked at in some some time so I thought, as they are so lovely I asked Midge if she would like to give them to her teachers. She said yes and added that she would like to put some candles with them. We bought two smaller Yankee candles and one large strawberry flavoured candle from The Card Factory for her main teacher. Midge got some hugs from her teachers so I think they went down well. 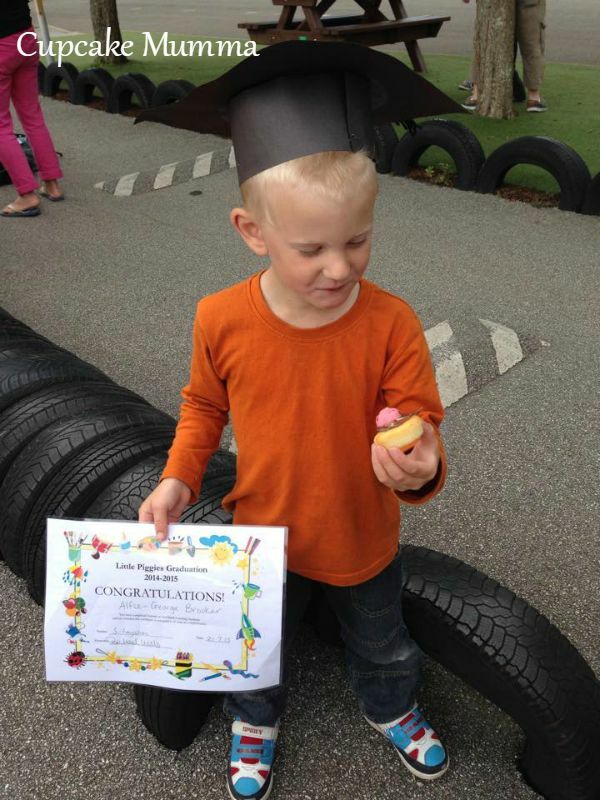 Little A had his nursery graduation a few days before the last day of term. The photos of the children on the large screen were quite a tear jerker but the actual singing and awarding ceremony were just filled with lots of smiles and clapping. 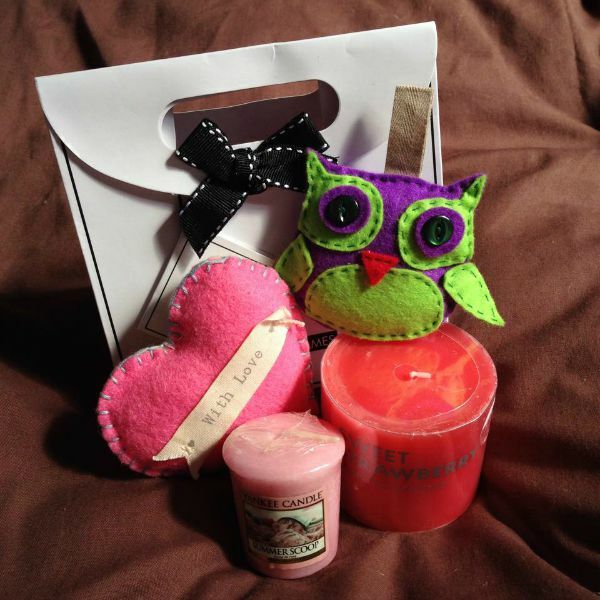 Finally Little A's lovely teacher gifts which I purchased from Danielle Louise Designs through facebook. 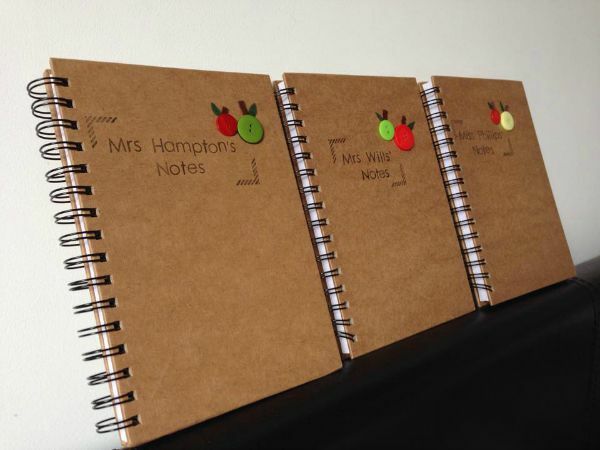 The notebooks were the perfect gift for Little A's teachers who have done so, so much for him and us since he started. 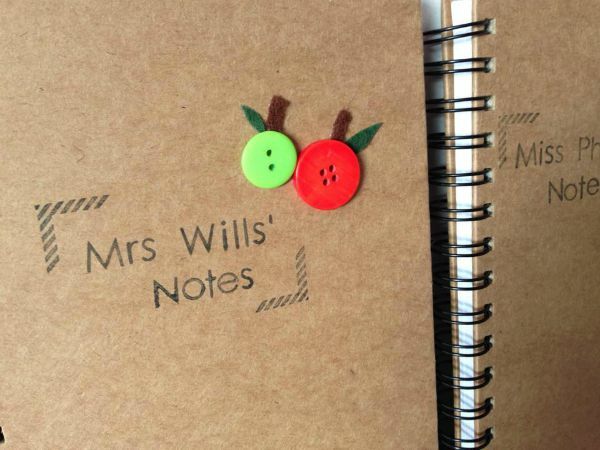 I ordered 5 of these notebooks in total and loved them all. How was last day for your children? Did you do teacher gifts this year too? 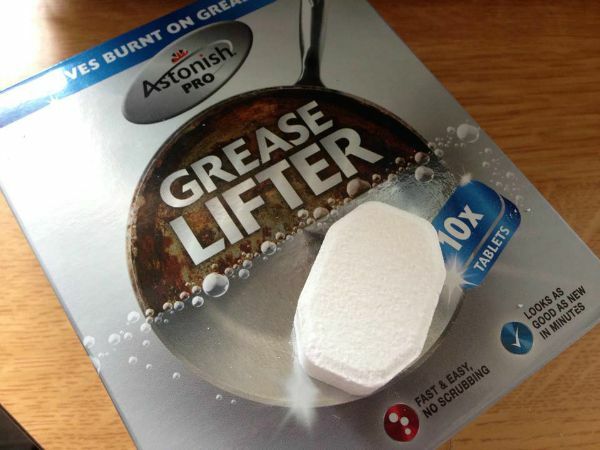 Check Out Astonish Grease Lifter Cleaning Tablets! My pans need some TLC before they go anywhere near some cake batter and what I really wanted to try my free Astonish Cleaning Tablets on for this review was my grill pan! 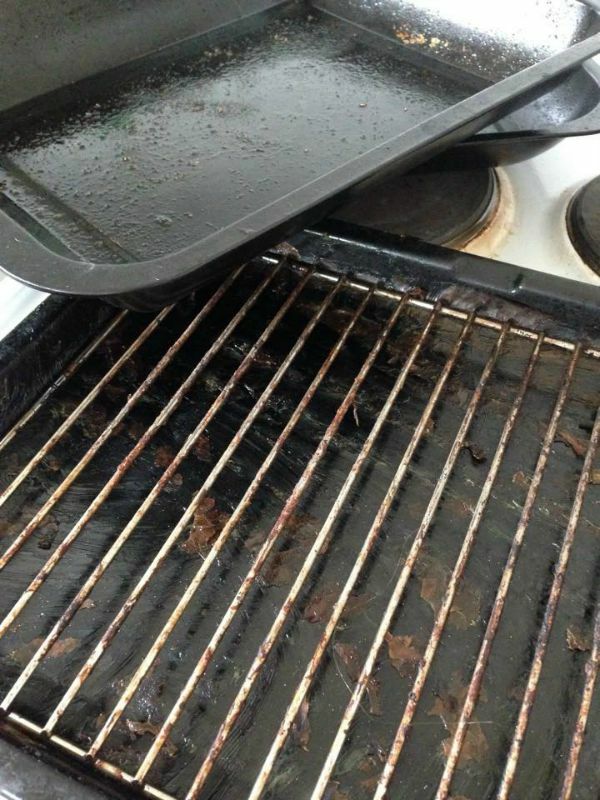 Granted, not used for baking but as you'll see below my pan is a test for any cleaning product that claims to remove grease, leaving me with shiny looking cooking equipment. 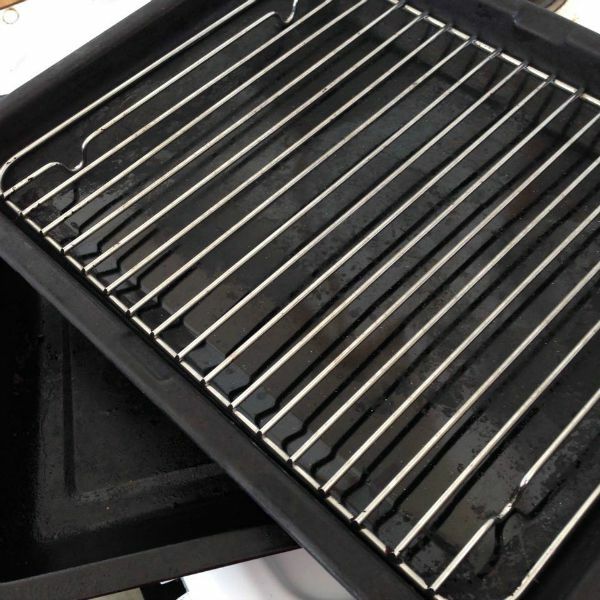 As you can see we are one of those families that use the grill for sausages or bacon and don't wash it immediately, instead using it again again until eventually we have no choice but to face the grease. I wasn't so bothered this time. I followed the instructions and added boiled water to my sink and added one tablet (I was prepared to add an extra as instructed to do so if the grease was particularly stubborn!) I added my pans into the water once the tablet was dissolved and 30 minutes later (on the instructions they say 20 minutes but I've always been one for leaving a little more time for these things) I returned and was very, very pleased with the results! I also left a small frying pan and a glass bowl in a freshly made sink-full of water but as is common for me I forgot about them and they ended up sitting there for hours. 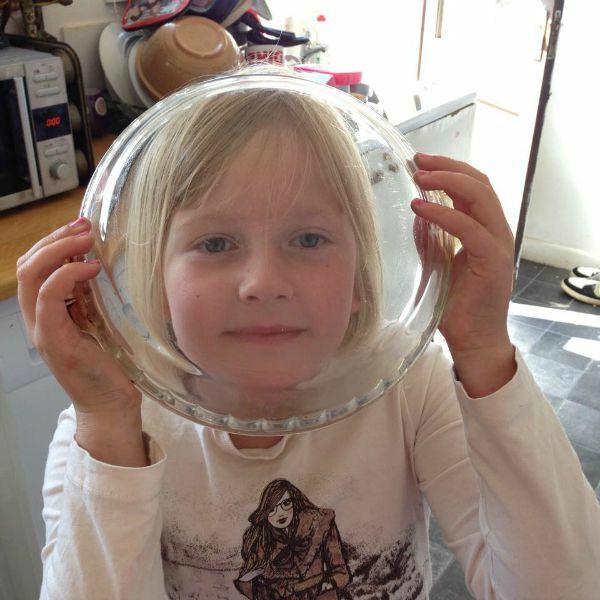 I was incredibly happy to see my glass bowl I've used for years as a rice pudding dish was really, really clear! I've scrubbed that glass within an inch of its life and never managed to lift the burnt on milk from those pesky edges. Of course it's been used for pies and what not too so I can officially say Astonish is my new favourite kitchen must have for my cooking equipment. It removes layers of grease, is so simple to use, is very cheap at only £3.99 per box which contains 10 tablets and as you can see above, removes stubborn over cooked marks too! It's also cruelty free which is a massive bonus. Try it yourself! Available in supermarkets! Watch this video for how to use your Astonish Grease Lifter tablets!